Peacock Alley has parlayed the appeal of men’s vintage striped shirts into a yarn-dyed jacquard bedding collection. The Billy bedding collection is a classic ticking stripe in 100% cotton from Portugal. The duvet cover and shams are finished with white satin stitch detail. Available in five fresh colors: Aqua, Blue, Coral, Green, and Linen. Don’t miss the Billy robe in the same fabric and colors. The robe is offered in a long or short style. 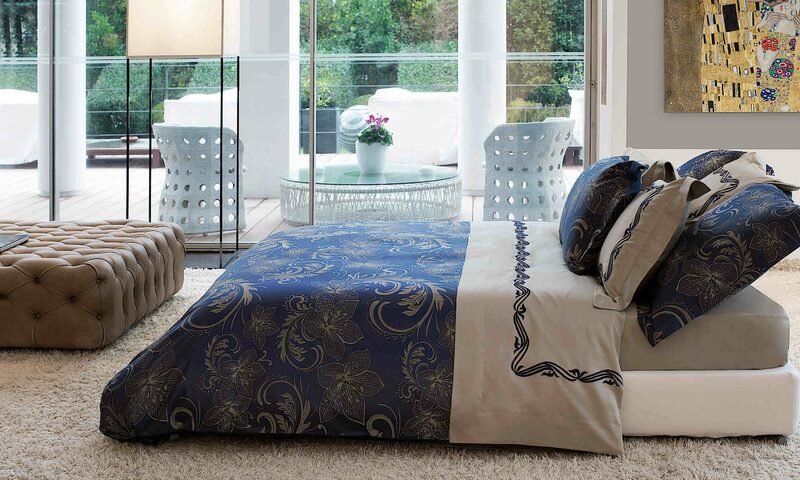 From Signoria Firenze, the Viola Lace bed linens combine contemporary with a vintage vibe. The special dyeing process and unique Italian finishing produce an extremely soft fabric in a 300 thread count 100% Egyptian combed cotton, which remains just as beautiful and soft even after many washings. The lace detail lends an old world Italian charm to these fine linens and is positioned as a U-shaped border the duvet top and borders of the flat sheet, shams, and pillowcases. The collection is available in four neutral colorways: White, Oatmeal, Smoke (grey), and Charcoal (dark grey). The Signoria Viola is also available without the lace detailing in the same colorways. Made in Italy. Available at DefiningElegance.com. 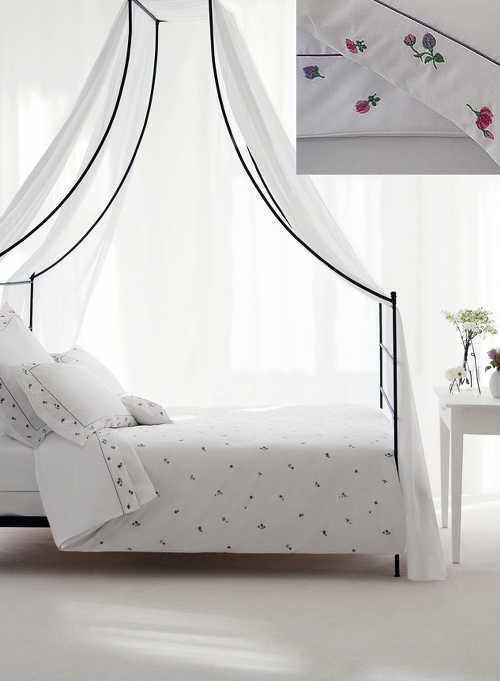 The Bouton de Rose percale bed linens from Nina Ricci Maison sets a fresh, clean tone in this canopy bed draped in billowy white. The abundance of white allows furnishings and shapes in the room to stand out while quietly drawing attention to the details of the fine linens. A sprinkling of small delicate embroidered rosebuds in shades of pink and mauve adorn the duvet cover. Mauve piping detail frame the embroidery repeated on the borders of the flat sheet, shams, and pillowcases. Made in France. See more of the Nina Ricci Maison collections at DefiningElegance.com. Women will be inspired by the beauty and serenity of the Lili Alessandra Lauren linen/cotton bedding elegantly draped over a bed of fine linens. A collection of lush pillows, a fringed throw, and sumptuous drapery panels puddled on the floor lend just the right dose of stylish accents to coordinate with this ensemble. 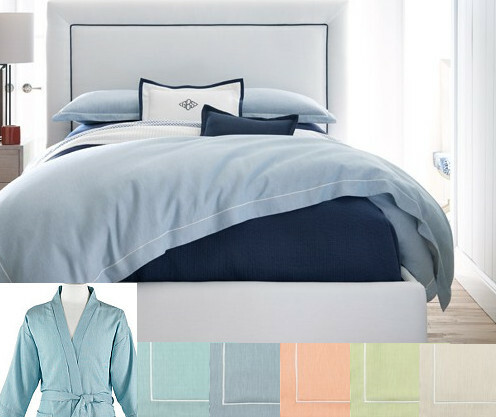 The Emily 100% linen quilted coverlet completes the look. Lili Alessandra collections mix old world patterns with uniquely woven, printed, or handcrafted textiles for timeless appeal. Available in Fawn/Ivory. 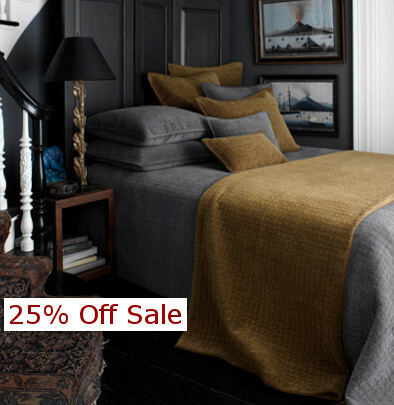 The Baltazar collection of bed linen from Alexandre Turpault is a blended linen/cotton satin weave embellished by a herringbone pattern. A two tone braided ribbon made of pure linen adds a unique detail to this sophisticated bed linen set. The neutral coloring makes it a perfect choice for coordinating with other fine linens or to use on its own. 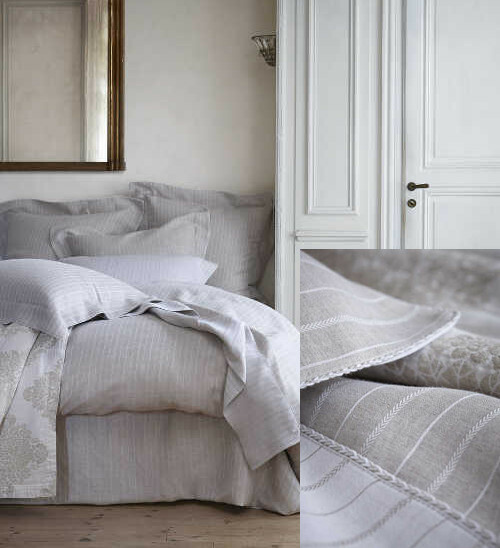 Alexandre Turpault , linen weavers since 1847, are known for their contemporary collections of pure linen, linen-cotton, and sateen cotton bed linens, table linens, and accessories. It’s easy to find inspiration in the Alexandre Turpault contemporary collections of glorious styles and colors that are meant to mix and match. Made in France. Available at DefiningElegance.com. The Lili Alessandra collections of highly embellished decorative pillows bring a classic old world charm that is irresistible. The Pablo series with its Spanish inspired design is offered in three options that include an Ivory/Straw velvet, Ivory/Fawn velvet, and a Fawn linen/Fawn velvet. 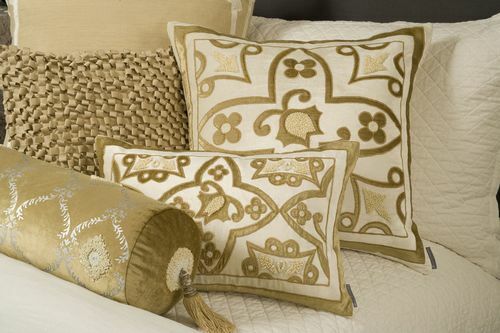 Each appliqued pillow is adorned with baby pearls. The Audrey bolster, also with baby pearls, and the ribbon square pillow make the perfect companion pieces. Lili Alessandra pillows combined with the incredibly soft Chloe washed diamond quilted velvet throw will amplify the glamour and transform your master suite into an alluring and comfortable haven. We invite you to see the entire collection of Lili Alessandra bedding ensembles, coverlets, throws, bed skirts, decorative pillows and upholstered headboards at DefiningElegance.com.